Take a trip to San Fransisco, where the architects of Feldman Architecture have created an iconic image of modern architecture, combined with influence from International style. 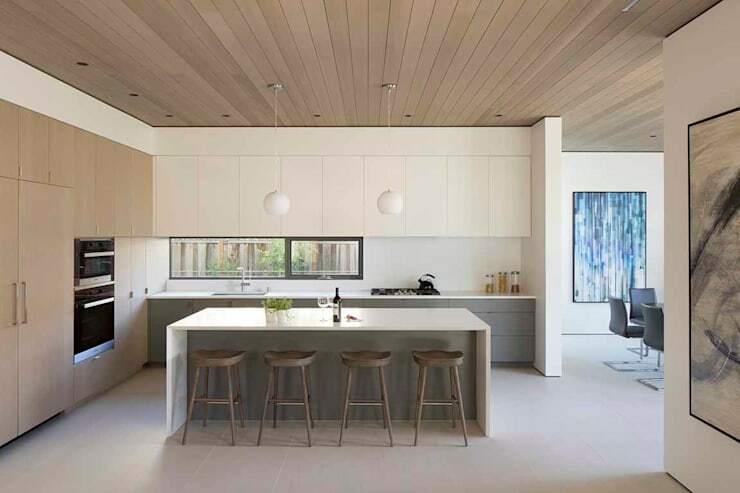 In a city where traditional, two-storey Monterey style homes characterize many of the established neighbourhoods, this home – nicknamed “The Lantern House” is a beacon of stunning simplicity. This practical, open, and honest family home is a manifestation of the “form follows function” principle that guides the creation of modern architecture, reaching outside of conventional style norms while maintaining a focus on the purpose or function behind every feature. The facade is composed of a three-part interplay of interlocking planes, with surfaces in natural wood, white, and glass. This design shows a fascinating range of depth, breaking away from two-dimensional limitations. And it isn’t just for show – a recessed front door instantly creates a shelter for the doorstep, while a slightly cantilevered upper storey provides an easy spot for adding light fixtures for the attached garage. Likewise, a protruding stair shaft (the natural wood mass) remains unobstructed, allowing for maximum natural light to enter the open shaft and illuminate the interiors. The distinction of the stair shaft is an example of an International style aesthetic, which tends to juxtapose exposed elements (beams, shafts, balconies, etc) with smooth surfaces, as in this facade. 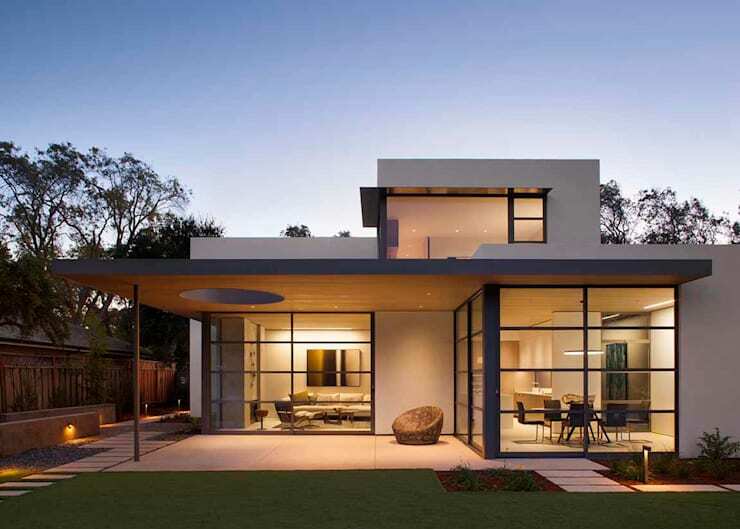 Like many modern designs, this house invites the viewer to see its inner workings, with the living room, hallway, front foyer, and staircase visible through large, glowing windows. The second storey floor extends in a simple design that creates a large sheltered area for the backyard patio. You’ll notice that the back of the home has been allowed to open up, manifesting a down-to-Earth, honest nature. The modernistic principle of “truth” is inherent in this welcoming design in which a transition from interior to exterior space is made effortless, where transparency becomes the defining element of the space. Modern architecture loves a good play on reduced forms – this circular cut-out draws attention to the absence of material rather than the addition of it, allowing light and darkness to act as the protagonists of the show. 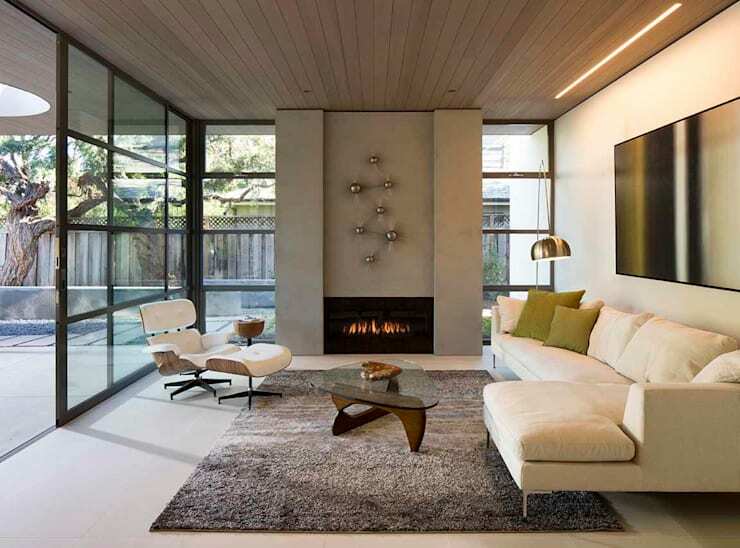 Throughout the interior, the home maintains a focus on materials and their unique qualities – this living room is shaped by the heavy smoothness of stone, the clarity of glass, and the natural warmth of wood. Add plush carpet, cool silvery spheres above a hot fire, and velvety white upholstery, and you’re looking at scene designed to delight and enrich the senses through the unique qualities of all its materials. In this practical kitchen, functionality is the defining element. This space has storage in surplus, coupled with a generous amount of workspace, an exceptionally large fridge, and a smooth, seamless aesthetic that turns clean-up into an easy task. A subtle theme is carried through the home’s decor, with an abstract geometric theme present in the art and other decorative embellishments, like this framed black and white painting. Notice how this work of art was carefully selected to reflect the rectangular and circular shapes found throughout the rest of the interior. 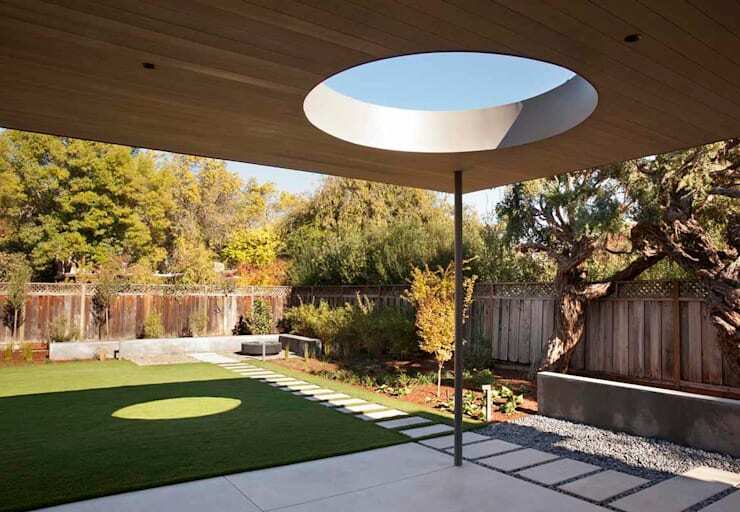 Following the geometric theme, this minimalist “chandelier” offers a clear reflection of the circular cut-out on the patio ceiling, using the mirror image to draw a common theme that connects the indoors and outdoors in a playful geometric dialogue. 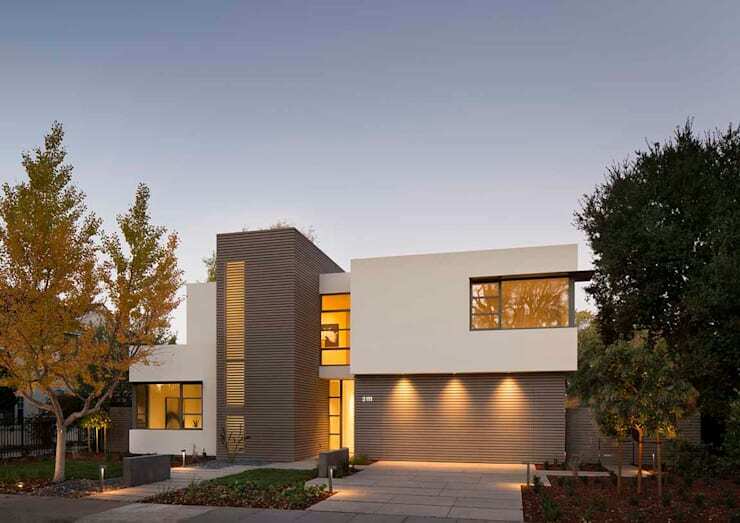 Share your thoughts on this modern San Francisco home below!